Tsubaki Advantage is a Customer Profile System that manages critical applications and documents cost savings in real time. The database compares and tracks the performance of the previously used products to that of Tsubaki product and calculates the money saved by switching to Tsubaki. Tsubaki Advantage computes the cost savings by comparing all aspects of the application including such things as maintenance costs, replacement costs, and the cost of downtime. In cost savings for customers who have switched to a Tsubaki value added product. Issue: After trying many brands of chain to increase life of this challenging serpentine drive, which historically wears chain rapidly, this well known end user was still only achieving 2 days to 2 weeks of chain life. After switching to Tsubaki G7 120RB drive chain, the end-user experience increased life to 5 weeks. Tsubaki Solution: Customer switched to Tsubaki standard 120RB drive chain and experienced an average life of 5 weeks whereas previously 2 weeks was the best. For these sizes the Roller Diameter and Inner Width are the same as the single pitch version. But the pitch is twice the size (hence the term “double-pitch”). Because of the pitch difference the pressure angle on the sprocket is different from the single pitch version. Therefore tooth counts of 30 or less a “double-pitch sprocket” must be used for “double-pitch chain.” For 31 teeth and above a double-pitch chain can use any standard single-pitch sprocket without any operational deficiency. 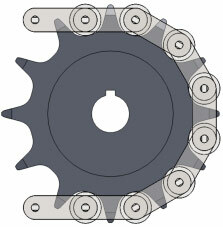 For example, a C2060H chain will engage properly with a 60B33 sprocket. However the same chain cannot engage with a 60B17 sprocket; in this case a 2060B17 sprocket must be used. It is important to note that standard roller double-pitch sprockets are double-duty, meaning there are two teeth per pitch. That means that the effective number of teeth is half the actual tooth count. Double-pitch sprockets can be supplied as Single-Duty Sprockets or one tooth per pitch. The benefit to this style is that the larger tooth provides greater shear strength in high shock loading applications. The challenge is they are twice as big. 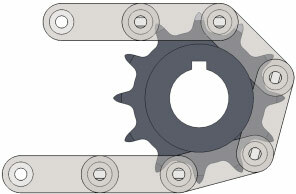 A large roller chain cannot run on the single pitch equivalent; for example, a C2042 chain cannot engage with a 40B15 sprocket. Because the roller is larger it will not “seat” properly in the sprocket tooth. Because of this specific sprockets must be ordered for sizes C2042-C2162H. These sprockets are “single-duty” meaning there is one tooth per pitch. It is important to remember when ordering, knowing where doubly-duty is the standard, what the number of “effective” teeth are. Because a single-duty sprocket will be twice the size of a double-duty sprocket with the same tooth count.